She professed faith in Christ and was an active member of Bethel First Presbyterian Church. She united in marriage to Roy Lawrence Dunham June 9, 1938 and he preceded her in death on September 2, 1985. In her honor, Mayor Tony Young proclaimed August 26, 2018 as “Mrs. Rachel Dunham Day”. 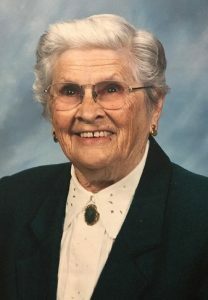 She had served as a volunteer for over fifty years, serving as a Cub Scout Den Mother, Girl Scout Leader, a volunteer for blood drives, community concerts, low income energy assistance, transportation for the Aged, Metzmeier Nursing Home and a member of the Taylor Regional Hospital Auxiliary for over forty years. She was known as a Christ-centered, caring and contributing ray of sunshine in our community and was especially proud of having five generations of her family. She is survived by two sons and two daughters: Gerald Roy Dunham and wife, Jane Christie Dunham of Cornelia, Georgia, Irving Earl Dunham and wife, Connie Harris Dunham of Meridianville, Alabama, Sylvia Dunham Pike and husband, Carrick (Rick) Pike of Franklin, Kentucky and Laura Dunham Berry and husband, Ronnie Berry of Elizabethtown, Kentucky; thirteen grandchildren; twenty-seven great-grandchildren and five great-great-grandchildren; many nieces and nephews and special friends. She was also preceded in death by two sons, Paul Irving Dunham and Howard Arthur Dunham and wife, Betty Pruitt Dunham and one brother and four sisters: Agan Howard, Margaret Perry, Flora Perry, Elizabeth Newell and Marietta Snedaker. EXPRESSIONS OF SYMPATHY ARE REQUESTED TO BE DONATIONS TO THE TAYLOR REGIONAL HOSPITAL AUXILIARY, BETHEL FIRST PRESBYTERIAN CHURCH, OR THE CHARITY OF ONE’S CHOICE AND MAY BE MADE AT PARROTT & RAMSEY FUNERAL HOME.